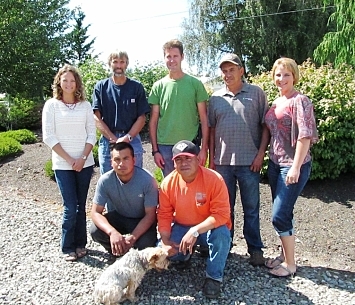 The deWilde's Nursery, located in the upper northwest corner of Washington state, is a family owned and operated wholesale nursery grower with 60+ years of field grown experience.The nursery was founded by Emil deWilde in 1949. His son Ed joined the farm in 1979. It is truly a team effort at our nursery and we value the hard work all members contribute. We specialize in growing high quality landscaping plant material. Consisting of Shade and Flowering Trees, Conifers, Ornamental Shrubs, and Ground Covers. Our specialty is landscape ready trees up to 4” caliper and conifers up to 12’. The 260 acres that we work has allowed us to refine our growing practices of pruning and staking to produce high quality plant material, while still selling at a very competitive price. Our potted nursery material is grown pot in pot, balled & burlap and pots. We can offer large container plants to our customers, including deciduous trees. The nursery propagates 95% of is production. We use soft and hardwood cuttings, field grafting and field budding methods. Lynden Washington is located in the beautiful pacific Northwest close to the Canadian boarder. Our location is in a microclimate zone that the USDA Lists as Zone 7. We are actually in a microclimate that frequently experiences arctic fronts from the Northeast that pushes our lows into the single digits. Effective 2005 the USDA issued an order regarding restrictions aimed at preventing the spread of the disease Sudden Oak Death (SOD). In compliance with this order we have been inspected and tested by Washington State Department of Agriculture and our nursery has been found free of Phytophthopora Ramorum, the causal agent of SOD. We are happy to ship our quality plants into all U.S. states and Canadian Provinces. Shipping cost is based on zip code, order weight, and is estimated prior to shipping. For our complete shipping policy please visit our Shipping Page, and our Terms and Conditions Page.